Try something heavenly with this quartet of cocktails…Angel’s Delight, Angel’s Kiss, Angel’s Tip and Angel’s Wing. 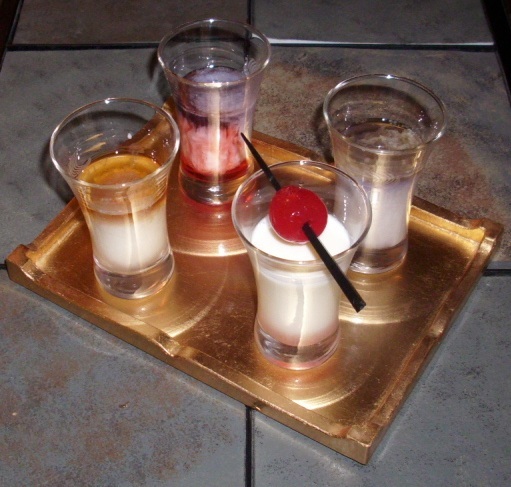 This quartet of pousse-café cocktails have been around since at least the early 1960s. The recipes appear in the 1964 28th printing of the Old Mr. Boston De Luxe Official Bartender’s Guide. The ingredients are presented in the order required to build each drink into its proper layers. Pousse-cafés are traditionally layered drinks served up as digestifs. The trick is to know each ingredients density and stack them from heaviest to lightest, which is all based on the amounts of dissolved sugar and alcohol content. Layering is typically achieved by slowly pouring each liqueur, one at a time, over the back of a teaspoon against the inside of the glass. They also need to be handled and served with care so as not to mix the layers. Pousse-cafés may be enjoyed by sipping each layer in turn or all at once as if a shooter. Carefully pour 1/4 ounce each of the above ingredients in the order presented. Pour 3/4 ounces of crème de cacao into your glass first, then carefully layer 1/4 cream on top. Garnish with a toothpick speared maraschino cherry. Carefully pour 1/3 ounce each of the above ingredients in the order presented. How I like it: While it’s lovely to craft these pousse-café with the care necessary to layer each ingredient and receive amazed kudos, these drinks are perfectly fine served up as blended concoctions. And they may need to be. Crème de Yvette isn’t readily available, and Crème de Violette, which normally is a perfectly fine substitute, may not have the correct density to suit. Additionally, the choice of cream may be troublesome. I used a vanilla-flavored coffee creamer, but it most certainly did not float on top. Besides, I’m partialy to blending instead of getting each flavor in turn, and these pousse-cafés’ flavors blend well. The Angel’s Delight tastes like a fruity milkshake. The Angel’s Kiss has a creamy floral flavor. The Angel’s Tip tasted like creamy chocolate—with a cherry! And the Angel’s Wing is like a creamy brandy. One may use Apricot brandy as a substitute for a bit more flavor. Heaven can wait; so drink responsibly! OK so I ASSUME you have ALL these ingredients?!!! Which two haven’t you heard of? By the way, recognize the glasses?